Synopsis: Henry is stolen away to Neverland but when Greg and Tamara’s “Home Office” turns out to be something other than they believe he finds himself on the run with a rogue lost boy while his family and Hook attempt to make their way to land. In the Enchanted Forest, Neal is cared for by Mulan, Aurora, and the Prince before embarking on a trip down memory lane an attempt to find Emma and Henry. After a long summer waiting we’re finally returning to the fairy tale mash up Once Upon A Time! In true OUAT fashion we can’t be relegated to just two worlds in the same time stream so we kick off our episode with a flashback of Emma giving birth to Henry. It’s a sobering moment as she’s locked to the gurney and when the doctor tries to show her the baby she just shakes her head and tells him she can’t be a mother over and over again. Of course, now she’s realizing just how stupid she was and we flash back to the main timeline to see her, the Charmings, Regina, Rumpelstiltskin, and Hook desperately holding on to whatever they can as they are sucked through a vortex back to the uncharted waters around Neverland. Instead of being all happy family, Emma is pissed at her mother and blames her for everything. Her positive, upbeat attitude and believe in good winning over evil basically means that they are never prepared for bad things to happen. So Emma blames her for losing Neal and Henry. This is only the first of many arguments and fights which nearly lead to their doom because, you know, we’re all about family friendly lessons here! At least we don’t have to worry about Rumplestilskin for long. As soon as they are in Neverland he peaces out to go find Henry on his own because he’s not a team player. Whose surprised? Anyone? Yeah. At least Emma and Hook can share a moment where he gives her Neal’s sword from when he was with the Jolly Roger’s crew. Henry finds himself in a spot of trouble when it turns out that Greg and Tamara’s “Home Office” turns out to be just Peter Pan using them to get to Henry. Pan doesn’t want to destroy magic – just Henry. So he sends his lost boys to go get him and they proceed to shoot Tamara and Pan tears Greg’s soul/shadow out of his body. This episode starts out pretty dark. At least Henry escapes – for now. He takes off running and teams up with a rogue lost boy who stole some faerie dust and is trying to escape himself. Unfortunately, the dust doesn’t work for him. Together they wind up evading the lost boys for a while until they get stuck on a cliff with the lost boys behind them. Henry – always the believer – manages to fly using the dust because in his heart he knows it will work. He has faith. That’s something his mother needs to work on. She doesn’t believe. At least initially. But that changes when the Jolly Roger gets attacked by Mermaids dead set on sinking the ship. When they capture one of them she tells them that they will destroy themselves as a wild storm rages around the ship. Thinking the mermaid is causing it, Regina turns her into wood. Meanwhile they all start bickering. Mary Margaret attacks Regina. 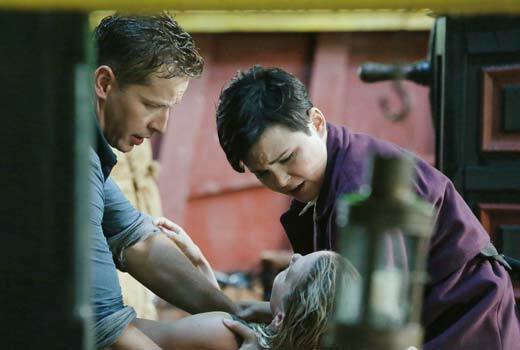 When Hook insults Mary Margaret, David gets into a fight with him. Emma realizes pretty quickly that the storm is caused by their fighting and tries to explain that to everyone… only to be knocked into the water. Luckily David saves her and she tells them that she was right. Also, that she believes. Neal also believes in magic. Back in the Enchanted Forest he’s been rescued by Mulan, Aurora, and the prince who have cared for his wounds. Aurora tries to dream walk again to contact Emma but realizes that it’s impossible – she’s behind her reach. As a last ditch effort to get in touch with her he decides to go to his father’s house and use some of his magical effects to contact her. Mulan accompanies her and it’s hilarious to see them together. Neal knows how to live in both worlds and tries to explain that in the real world everything is just stories and that Mulan has a movie made about her. Except, of course, she doesn’t understand what movies are and Neal has known idea how to explain. 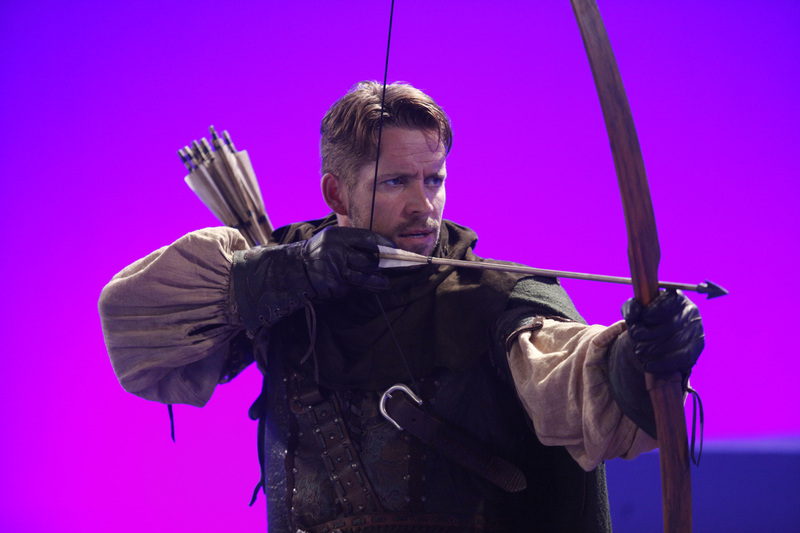 When they manage to get to Rumplestilksin’s house they run into Robin Hood who has been recast for this season. He tells them the house is now his and Neal doesn’t argue. In fact, he gives it to him and explains that he’s the Dark One’s son. Which be believes because he says no one would lie about something like that. Neal manages to find the orb that can show him where Emma is and he’s distraught to see that she isn’t in the Enchanted Forest but back in Neverland. Which, I assume at some point means that he and Mulan – and probably Aurora and Phillip – are going to find their way into Neverland, too. But we will have to wait until next week to find that out. We do find out that Rumplestilksin has plenty of history with Pan which probably shouldn’t be that surprising. He knows everyone. It’s not a good history, though. Pan says he’s welcome in Neverland but not if he’s going to come after Henry which, of course, he will. The lost boy lacky that Pan sent to confront him tells him that he will lose if he goes up against Pan and Rumple acknowledges that. Remember when we found out that Henry would be his downfall? It looks like Once Upon A Time is setting Rumple up to be a martyr for Henry. But that doesn’t seem like his style at all so… we’ll see how this really ends. And, unfortunately, the mystery of who Henry’s friend is becomes very obvious. It turns out that it’s actually Peter Pan! Shock. Except not really. I kind of figured that from the get go when the kid didn’t give him a name but whatever. It’s Peter Pan and he’s after Henry because he’s so damn trusting and believes so fully. He needs someone with a heart as pure as Henry’s so… good job Henry. Way to be a good kid who believes in faith and hope and love. Because now you’re a slave to Peter Pan and the lost boys. All in all, really good way to start the third season! It got me excited for the show again after the second season sort of lost me for a bit. I’m hoping for a strong season so… let’s hope things keep going strong from here on out! Tamara and Greg’s deaths were badly written, making this episode pure crap for me. And it verified OUAT’s failure to write well developed characters for minority actors – especially those who are African-Americans.